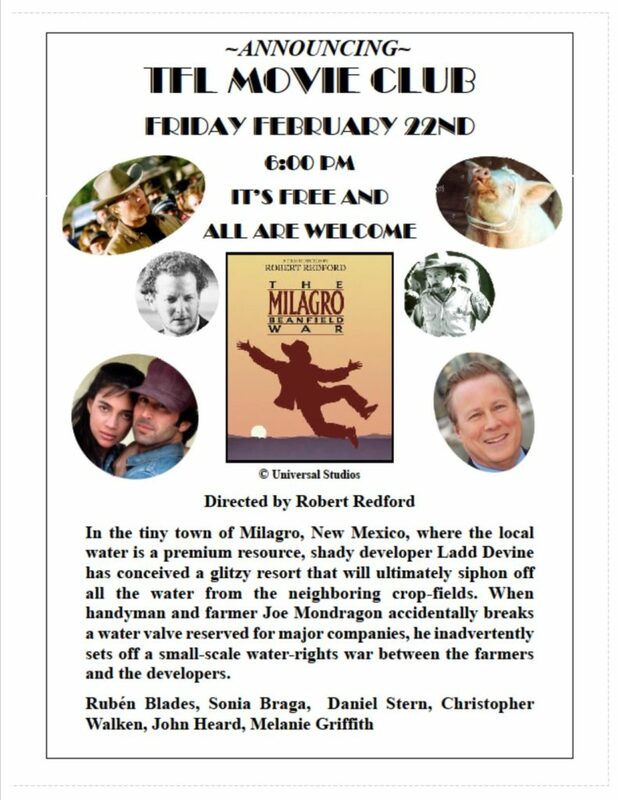 The TFL Movie Club premieres on Friday, February 22 at 6 pm with a showing of “The Milagro Beanfield War” directed by Robert Redford. This free, monthly film series will feature undiscovered gems. TFL’s own cinephile Tom Lyford, describes this 1988 indie comedy-drama, (based on the John Nichols’ book) as “both lyrical and fanciful” and believes that “it got lost amid the shadows cast by the super-hyped Hollywood blockbusters.” Redford artfully guides a terrific ensemble cast through the familiar conflict powerful land developer vs. naïve townspeople in a rural New Mexico town. Those attending are invited to stay and discuss the movie afterwards. And, yes, there will be popcorn.